This was going to be an easy picture. The summer issue of Somerset Life is out and I am once again happy happy to be one of the contributors. 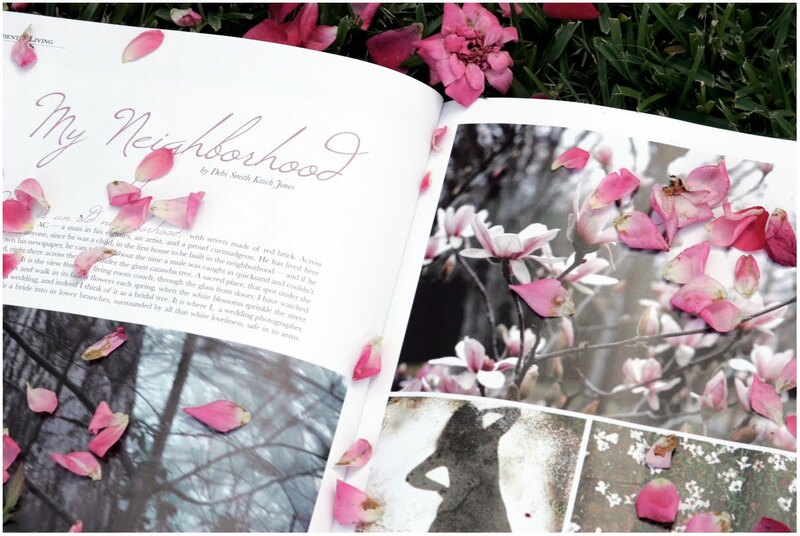 Happy happy to talk about my magical neighborhood, to introduce its trees and fallen flowers to new readers. More than happy happy. I thought what better way to say this than to nestle the magazine amongst those flowers, plenty of crepe myrtle blossoms on the ground, all pinks and whites and speaking the language of summer. And then it rained. You remember. I told you. And all those fallen blossoms washed away. I could've picked some from trees, but so many trees had the blooms washed right off their branches, and I felt funny stealing them from strangers; I felt perfectly entitled to steal them from friends and neighbors, yes, and I know that's silly, but there you go. Silly. So I stole these rose petals instead, right from City Hall, just a few, I figured they wouldn't mind; I stole them from inside the rose bushes and I stole petals that were just about done, and after all, the article is about here. They should be pleased to know such a thief as I, and if the mayor says anything to me, anything hinting that I shouldn't'a done it, I will buy her a copy of the magazine. I think I will anyway. It is a gorgeous issue. As always. I am once again surrounded by women I admire and love. Christen and the gang at Stampington have outdone themselves; I don't have the words to tell them how much it means to me so I will just say thank you. The cover itself, a photo by Leslie Shewring is to-die-for beautiful. My hands still smell like rose petals. I'll keep some in the magazine. oh i must go out and get a copy. i don't think City Hall will mind one bit that you took a few petals from spent blossoms. Beautiful photo of your beautiful photo!! And, yes, the rose petals MUST have a home inside. To mirror the blossoming of your heart. what wonderful news from such a talented lady..rose petals and all!! I LOVE that you stole the rose petals...I LOVE that you are in the magazine...today is my day to go out and I can't wait to get it. you are such a perfect fit for that magazine....don't they know they should give you a monthly spot in it ! Easy or not, it is a gorgeous gorgeous photo. And honestly, I love that you stole those rose petals... I would do the same, actually. And somehow, even thought it's rather naughty, it seems like a very beautiful thing. oh my goodness... i rec'd my copy today... and i found your article right away. i have yet to read it...i'm saving it for the front porch swing tomorrow. soo happy for you..... so well deserved. Oh yes, a monthly spot for you. Now I must run out and get the new magazine. It is my favorite one. Wonderful rose thief you:) I must go get my copy, it's such a wonderful publication. Congratulations! Hip hip hooray for YOU! How awesome are YOU! And I'm smiling here tonight, imagining you sneaking into the rose garden at City Hall - which if it's anything like the City Halls here in NJ, have the POLICE STATION ATTACHED TO IT!!! Really, I think the mayor would be quite happy to see the town featured in such a beautiful magazine. Good for you! I'm going to look for the issue at the local Barnes & Noble. I know you must be giddy. Congratulations again! Off to the bookstore I go today! Your article looks so beautiful from here...a sneak peak, a wee preview of the beautifulness.